Did you get Salmonella because the chicken on holiday was undercooked? Were the beef burgers at you hotel still pink and gave you E coli? Do you want compensation for a holiday ruined by food poisoning? You can make a compensation claim for holiday food poisoning against your tour operator if your illness was in the last 3 years and your holiday was a package. Chicken is the leading cause of food poisoning abroad whilst beef products such as burgers closely follow. At Simpson Millar Solicitors our food poisoning claims experts frequently receive complaints from holidaymakers returning from foreign hotels about chicken being served bloody or the burgers being served pink in the middle. Illness outbreaks at hotels are frequently caused by food contaminated by bacteria which in chicken is typically Salmonella or Campylobacter and in beef is usually E Coli. There are primarily two different bacteria involved when someone contracts food poisoning on holiday through chicken. These bugs survive in the intestines of chickens and other poultry and farm animals and are passed on into the food chain mainly through faecal matter. The symptoms of Salmonella and Campylobacter may appear at any time from 6 to 96 hours after the contaminated food has been consumed. This is referred to as the incubation period. It is the period when the bacteria has been ingested and is multiplying and attacking the stomach lining. A report published by the Food Standards Agency in October 2009 reported that 65% of chickens sold in the UK were contaminated by the Campylobacter bacterium and that there were 55,000 cases of Campylobacter reported in the UK every year. There are several bacteria commonly implicated in food poisoning at hotels when beef is contaminated. 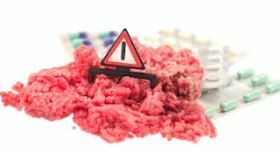 In addition to bacteria beef can be the subject of the parasitic infection Toxoplasmosis if it is undercooked and the meat has been in contact with infected matter such as bird or animal faeces. Beef food poisoning is not just limited to joints of beef but extends to other food types including pies, sausages, cooked meats and pates. The symptoms of beef food poisoning usually appear quite rapidly and with 48 hours of the food being eaten. For the same reason as with chicken described above food handling practices and hygiene at hotels on holiday may be inadequate. The main cause of beef food poisoning is simply undercooking which is often the case at snack bars and barbecues at hotels abroad. Another leading cause is when the meat has been contaminated by, for example, raw chicken which can transfer unpleasant salmonella and campylobacter bugs. It only takes ten E Coli bacteria in an undercooked burger to cause an attack of E Coli. The largest outbreak of E Coli in the UK occurred in Wishaw, Scotland, in 1996 when contaminated meat infected 200 people with 20 cases proving fatal. Did You Get Salmonella or E Coli on Holiday Abroad? If your holiday was spoilt by food poisoning then talk to an E Coli and Salmonella Illness Claims specialists at Simpson Millar today. Sickness and illness at hotels abroad should not happen if tour operators ensure that the hotels they use comply and operate efficient hygiene and critical control point (HACCP) systems which safeguard against the risk of cross contamination and food poisoning. 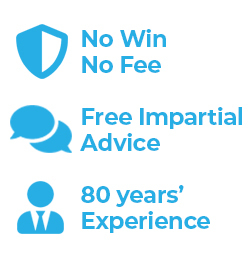 If you are interested in pursuing a compensation claim and need some free advice call our Holiday Claims Specialists today.